The mountain bluebird is a summer resident in Utah and nests throughout the state. 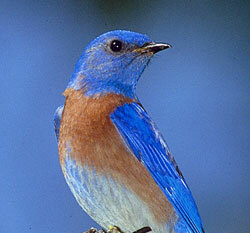 The western bluebird summers in the Utah "panhandle" and migrates throughout most of the state. Bluebirds are usually found in fields, open woodlands, parks or along golf courses or other open areas, including suburban locations with open spaces and scattered tress. In the mountains they are found in clearings and meadows. 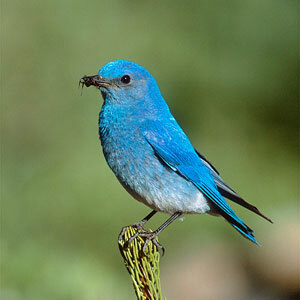 The mountain bluebird is well known for its hovering flight as it hawks for insects. In Utah nesting can commence early spring and can continue well into the summer. One or two broods is typical for both species. The eggs are a pale blue. A typical clutch size is 4-6 eggs. If you are managing a bluebird house, watch for house sparrows trying to use the next box and immediately remove any house sparrow nesting material.